Examine what it means to develop and assess the concepts of fractions, decimals, ratio and percent through the use of multiple representation models. A lesson will be modeled and then participants will construct other lessons applying that model and co-constructing assessment items that reflect multiple representations. 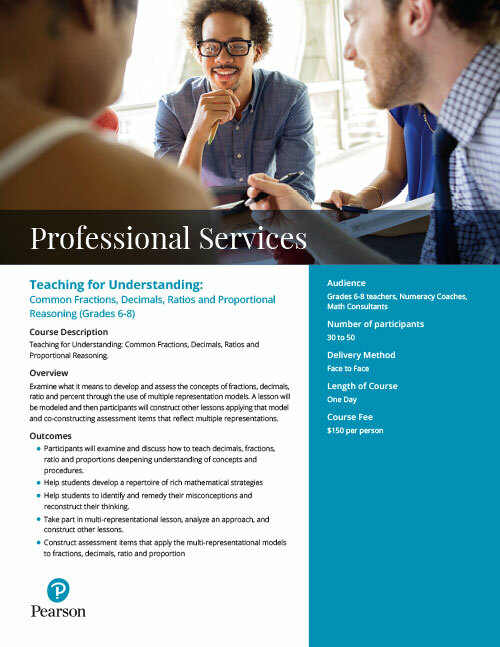 Participants will examine and discuss how to teach decimals, fractions, ratio and proportions deepening understanding of concepts and procedures. Help students to identify and remedy their misconceptions and reconstruct their thinking. Take part in multi-representational lesson, analyze an approach, and construct other lessons. $150 per person with a minimum of 30 participants and a maximum of 50.